Valentine’s Day is nearly upon us and who doesn’t love roses and jewelry? Get the best of both worlds with these gorgeous jewelry was dipped roses! I hope you will be enjoying Valentine’s Day as much as we will! Good luck! Jenn’s Blah Blah Blog and some of her favorite bloggers from around the globe have come together to offer one lucky winner a chance to win 1 Dozen Jewelry Wax Dipped Roses, PayPal Cash, or an Amazon Gift Code. Winner will choose their prize. Have you heard of 1 Dozen Jewelry Wax Dipped Roses? They’re fabulous! Scent lasts up to 6 months, all roses are wax dipped and smell like fabulous fresh-cut roses. They come in several different colors such as: Pink, Yellow, Cream, Baby Blue, Lavender, and Red. Each dozen of Jewelry Wax Dipped Roses comes with a fabulous piece of jewelry value from $10 all the way up to $7,500. Special thanks to all the bloggers that have come together to bring you this fabulous giveaway. This fabulous giveaway will run from 02/10/2013 at 12:01am EST until 02/14/2013 at 11:59pm EST. 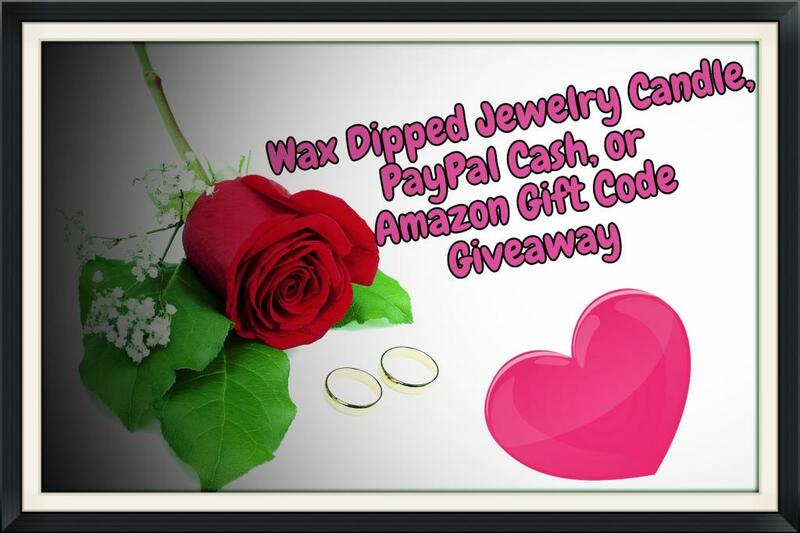 One lucky winner will win their choice of Wax Jewelry Candles, $50 PayPal Cash, or $50 Amazon Gift Code. We wanted to be sure EVERYONE has a chance to win so this event is open WORLDWIDE. Winners outside of the US will not have Wax Rose option. Sorry we cannot get these delivered outside of the US. Please use the Rafflecopter to enter! Good Luck! Disclosure: I was not compensated in any way for this giveaway, nor am I responsible for shipping. Jenn’s Blah Blah Blog and Diva Fabulousa will see that the prize is shipped to the winner. Winner will have 48 hours to respond to winning email. This giveaway is in no way sponsored, endorsed, or associated with Facebook, Pinterest, Twitter, Google, or any other social media network. I will just be spending Valentine’s Day with my family. As far as I know we don’t have anything special planned. I plan on spending vday with the hubby having a romantic dinner at home and getting rid of the kids! It is my 22nd wedding anniversary. I will be spending the day with my kitties. Hopefully I will have extra treats for them. I will be spending Valentine’s Day with my boyfriend of 15 years. I love how my husband goes all out to treat me with romance. I get to feel as a woman instead of wife and mom for a day. I am looking forward to a lovely evening with my husband and his wonderful cards he gets me. I am looking forward to spending valentines this year with my husband and 2 sons in our new house we bought 6 months ago. 🙂 I think we are going to have a movie night and then a soak in our jacuzzi tub! Date for my husband and me……kids got a baby sitter and we are FREE! One night of just us! I will be working this valentines day. Unloading trucks. boo. I will be doing pizza and Hotel Transylvania with my three grandchildren. That to me is a great Valentine’s Day. My husband made plans this year and I am looking forward to spending time with him. I will spend it with my husband, remembering the wonderful puppy he gave me our first Valentines day together. My husband & I will just be spending the night at home. Probably with a movie or something. Thanks! My husband and I are having a romantic candlelight dinner. I’m looking forward to some alone time. My husband and I are just hanging out at home. just spending time with hubby. this is our first v-day as ’empty nesters’ and we are really looking forward to a lovely (and peaceful) evening! Date night with the hubby! First time for valentines day in 6 years! Nothing special, home with hubby, nice dinner…relaxing evening! Well, Valentine’s doesn’t fall on garbage day, this year, so I won’t have to nag my husband…about the garbage! My husband has made plans for us. Will be celebrating V-day with my family. I will be spending Valentines with my kids, working and doing homework. We will probably go out to dinner for Valentine’s day. I’m hoping there will be a little box of chocolates to share with my family…not TOO little, though! I will be going on a date night with my husband! I am looking forward to baking for my family and then going out with my husband. I’m looking forward to getting some dark chocolate covered cashews. My boyfriend and I will be spending a quiet evening at home. He’s going to make one of our fave meals and we’ll probably do some champagne. Enjoying quiet night at home. I will be spending it with my fiance having dinner out with a movie! I will be spending it with my TV. We don’t really do anything special for Valentine’s Day. We exchange cards and a little treat. I will be making a nice dinner for my son. I would like some chocolate. I have to work and so does the hubby, so we will do something on the weekend. Hubby and I are going to dinner and a movie! This V-day I want nothing more then a nice relaxing day wiith the fam. Anything else is just an added bonus. I am making homemade candy for the kids and going out with my husband. Spending the night with my husband and dogs. I’m staying at home all alone! Dinner and a Movie with my Husband.